Thinking about starting a podcast? Wonderful! The world needs to hear what you have to share. 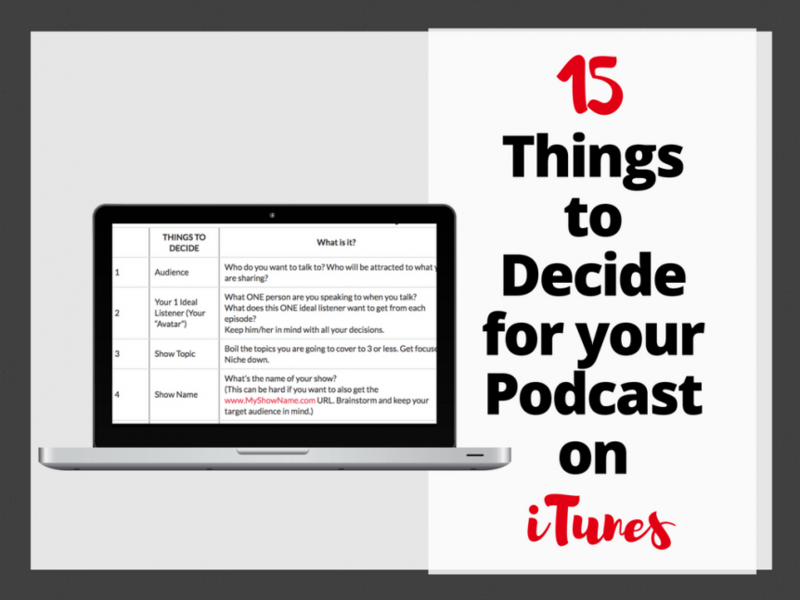 To help you plan ahead and see what is coming for submitting to iTunes and other audio sharing platforms (like Stitcher, SoundCloud, and iHeartRadio), here is a list of 15 things you need to decide on before your podcast is ready to hit the waves of iTunes and others! Okay, let’s break each of these down in more detail with some examples. THINGS TO DECIDE What is it? 1 Audience Who do you want to talk to? Who will be attracted to what you are sharing? 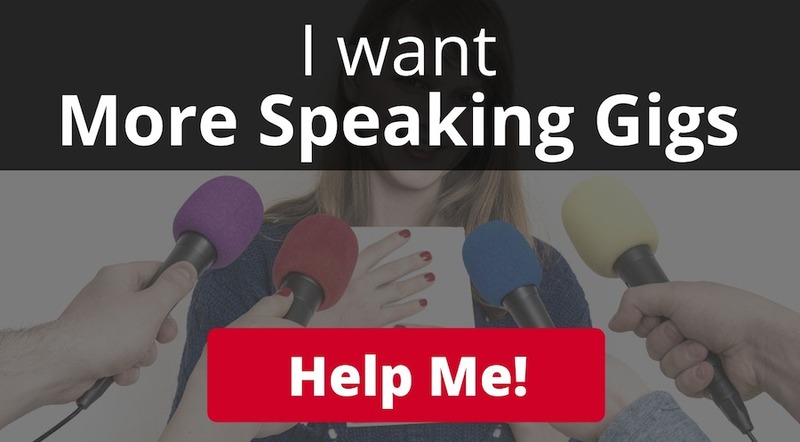 2 Your 1 Ideal Listener (Your “Avatar”) What ONE person are you speaking to when you talk? What does this ONE ideal listener want to get from each episode? Keep him/her in mind with all your decisions. 3 Show Topic Boil the topics you are going to cover to 3 or less. Get focused. Niche down. 4 Show Name What’s the name of your show? 5 Show Subtitle Think “keywords” here and drop in some key ones to help your being found via search. 6 Show Description Again, think about keywords but also make it flow for someone reading all the way through. According to Rob Walch of Libsyn, show descriptions do NOT impact search in iTunes. So write it to convince people to click and listen! 7 iTunes Category This is where your show will show up (and compete with) other shows in the same genre. Some are highly competitive and others less so. 10 Keywords / Tags This is required if you host with Libsyn, but even if it’s not required for your host, it’s important to brainstorm the topics you are going after to rank it when people search. No matter how often you publish, you should be consistent and deliver on what you say you will. The more frequently you publish, the more downloads you will get compared to less frequently if you look just on downloads from people subscribed. But if you publish frequently, will you have time to promote each one? And keep up the pace? 13 Music Pick something that matches your topic, tone, and genre. Also consider how it sounds with the intro/outro overlaid on it. Keep it concise and punchy. Pull the listener in…and sign off with a call to action to engage with you further. Needs to be 1400x1400px to 3000x3000px but optimize for 150x150px viewing. People will see the tiny version on their phones so lots of text and small fonts will not look good. BONUS Hosting Platform It was brought to my attention from Elsie Escobar of She Podcasts that all hosting platforms are not alike and it’s worth doing some homework before committing. Okay, now that you have a better idea what each of the 15 items are for publishing your podcast to iTunes, let’s look at two shows as examples so you can see what it looks like in podcast practice. Both podcasts were launched in 2016. We’ll use my show Copy That Pops since I know it the best. 2 Your 1 Ideal Listener (Your “Avatar”) – Meghan is in her early 30’s and she is married but no kids yet. – She is an entrepreneur and has been working on her business for a few years, but it isn’t as far along as she wants yet. – She is a current or aspiring digital nomad (who can work anywhere with wifi). – She is still actively looking for tools, tips, and tactics to get an edge and hit her goals. – She loves networking and enjoys listening to some personal information from the host and guests as long as they also cover things she can start using right away. – Meghan thinks psychology is fascinating and doesn’t think she is a terrific writer but realizes its importance for online success in business. 6 Show Description Join us to learn tips, tools, and tactics to improve your copy, branding, and messaging for improved connection to your audience, opt-in rates, sales, and profits. Leverage psychology, word choice, and tools to convert leads into customers by ‘speaking’ to them in the right way with all your digital marketing efforts. Host: Laura Petersen — Psychology Instructor, Digital Nomad, Word Nerd, and Serial Entrepreneur. Format: Mix of fun and informative interviews with other entrepreneurs and quick copy tips for immediate application. Laura is a teacher by trade and at heart. She is passionate about helping other entrepreneurs (especially the ladies #girlpower) get more out of their businesses so they can design the life of their dreams and maybe join her for a cup of coffee wherever in the world she may be with laptop in hand. Tune in to learn, be inspired, and join the conversation! 11 Episode Goals Entertain (get stories out of guests for the audience to connect with and get to know them) and provide tactics, tools, and tips to use right away. 14 Intro & Outro Recorded by my partner at Podtent, Dominick Sirianni, because he has an amazing voice and I wanted a male voice to offset mine. Next let’s look at Tiny Leaps, Big Changes which is doing incredibly. 1 Audience 23-35 year old 9-5er who has always wanted to make a change in their life but hasn’t been able to make those changes permanent. 5 Show Subtitle Simple, research-backed strategies to get more out of life. 6 Show Description All big changes come from the tiny leaps we make every day. On this show I’ll share personal development and self help strategies you can use as well as the habits you can develop to get the most out of your life. Everything I share with you will be backed by research in various fields of science and I’ll end each episode with a specific challenge to help you integrate that strategy into your life. This is the show for you if you are interested in personal development, personal growth, self help, self development, motivation, or inspiration. – You regularly listen to speakers like Jim Rohn or Tony Robbins. – You read books like Rich Dad Poor Dad, The Compound Effect, The Four Hour Work Week. 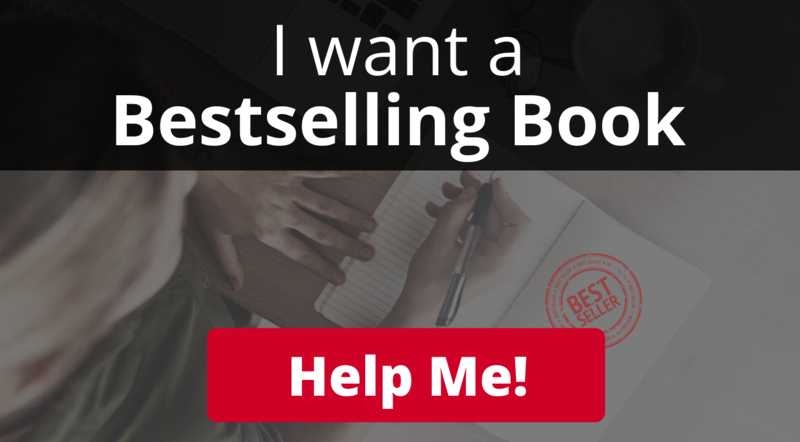 – You love authors like Ryan Holiday, Tim Ferriss, Tony Robbins, or Gary Vaynerchuk. – You are looking for a way to get more out of life but are sick of all the nonsense that lifestyle design, personal development, and self help have to offer. 8 Show Format 10-15 minute solo presentations. 11 Episode Goals Entertainment. Inspire other to do their own research and build their own processes. Okay, now it’s your turn to figure out your important items for your podcast and get it live on iTunes and the other growing platforms!